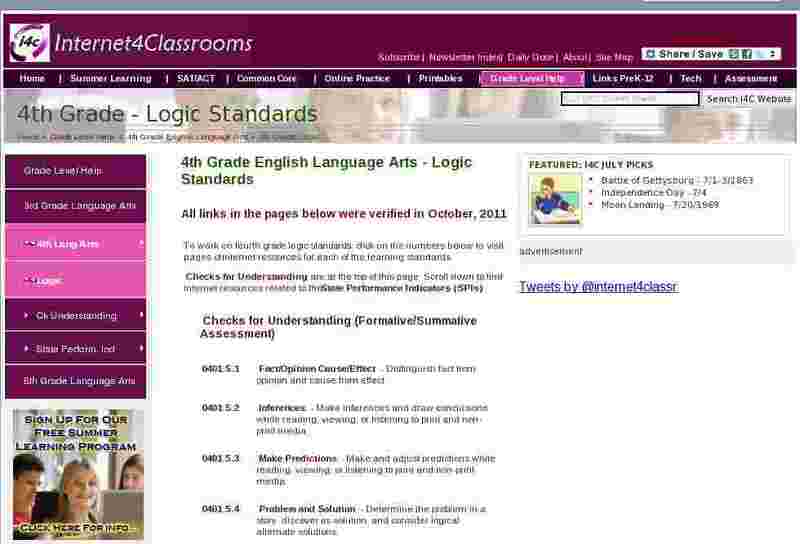 To work on fourth grade logic standards, click on the numbers below to visit pages of internet resources for each of the learning standards. 0401.5.1 Fact/Opinion Cause/Effect - Distinguish fact from opinion and cause from effect. 0401.5.2 Inferences - Make inferences and draw conclusions while reading, viewing, or listening to print and non-print media. 0401.5.3 Make Predictions - Make and adjust predictions while reading, viewing, or listening to print and non-print media. 0401.5.4 Problem and Solution - Determine the problem in a story, discover its solution, and consider logical alternate solutions. 0401.5.5 Analogies - Complete word analogies employing synonyms and antonyms. SPI 0401.5.1 Locate Information - Locate information to support opinions, predictions, and conclusions. SPI 0401.5.2 Cause-Effect - Recognize cause-effect relationships within context. SPI 0401.5.3 Fact/Opinion - Distinguish between fact/opinion and reality/fantasy. SPI 0401.5.4 Complete an Analogy - Choose a logical word to complete an analogy using synonyms and antonyms. SPI 0401.5.5 Make Inferences - Make inferences and draw appropriate conclusions from text. SPI 0401.5.6 Sequence Events - Indicate the sequence of events in text.